Japanese Episode AG 150: "The Battle Arena! The Hand-to-Hand Fighting Showdown!!" American Episode 420: "Wheel of Frontier"
Satoshi has finally arrived at the Battle Arena! As he arrives, Satoshi is greeted by Enishida, who tells him all about the Frontier Brain he'll be facing: the fighting-type pokemon trainer Kogomi. After carefully considering Kogomi's likely choices for battle, the young trainer faces off against his opponent. The first match pits Satoshi's Juptile against Kogomi's Hariteyama. Juptile's Seed Machine Gun technique proves to be useless, so Satoshi alters his attack plan to take advantage of Juptile's speed. Kogomi is caught off-guard at first, but before long she figures out a way to use the grass-type pokemon's speed against it. After Juptile's defeat, Satoshi calls on his second pokemon: Kabigon! Satoshi's pokemon is able to take hit after hit before it lands a devastating Ice Punch that knocks out its opponent. Now that both trainers are down to one pokemon apiece, Kogomi reveals her second choice: Charem! Charem starts off the battle by buffeting Kabigon with a series of Focus Punches before Kabigon strikes back with an Ice Punch. Charem responds with the same attack and ends up freezing the normal-type pokemon! As Kabigon is pummeled some more, Satoshi has his pokemon store up the energy it needs to fire a Hyper Beam on the ground, shooting the pokemon into the air and enabling it to perform a high-powered Body Slam attack! Charem is crushed by its massive opponent, knocking it out and earning Satoshi his second Battle Frontier victory. Kogomi gives Satoshi a Guts Symbol for his hard work and tells him of the Battle Dome, where he will be able to compete for his third Frontier Symbol. With two Frontier Brains down, Satoshi eagerly heads toward the site of his next battle. Satoshi's second Battle Frontier battle is an important one because it sets the stage for the next few battles in that it only allows one episode for Satoshi to meet, battle, and defeat the Frontier Brain. Heath and Azami will only get one episode apiece, and I, for one, think that's a shame. It feels like the anime producers are trying to rush through these early Frontier Brains, and I think it's a shame that a good portion of the Frontier Brains are reduced to slightly more important Characters-of-the-Day. 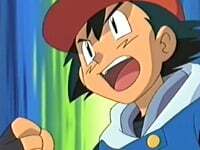 This episode is Sarah Natochenny's first Ash-centered episode, and it's...less than stellar. The actress is really too monotone for her own good, and some of the season's most mocked lines come from this episode. The music was another big issue for me...now I know that some of you will applaud PUSA for keeping a lot of Japanese music (nine pieces to be exact), especially since some of it is old Kanto music that dub fans haven't heard in years. But the thing is that the Japanese version has about eighteen music cues (nineteen if you count the Battle Frontier vocal used in the episode's climax), meaning the dub only really retains half of the original music. While that is a higher amount than what dub fans are used to (the average 4Kids episode probably only kept about 30% of the Japanese music, tops), it's still a long way to go from being acceptable. Scott's new PUSA voice is alright, I guess. While it's still a little...slimy, at least it's not as creepy and child molester-ish as his 4Kids voice was. And I guess Greta was alright, even if it was a bit forced. In the Japanese version, Numaclaw replaces Mizugorou in the opening theme animation. The Japanese producers have been updating pokemon rosters in the ending themes before (Smile, Glory Day), but I believe this is the first time it's done for an opening theme. In the dub version, Greta and the others say "oish" up until the episode's halfway point. Now the Japanese version has the characters saying osu! (the u is silent), but I don't know how PUSA got "oish" out of that, especially since they probably dub the show straight from the translated script without even listening to the Japanese version. The suckiness of Sarah Natochenny deserves its own section. Ash: "I'm so ready. Can't wait." And then this next line, where he's just brimming with excitement...BRIMMING, I say! Ash: "I know. But I'm gonna win it anyway." You'll notice my lack of exclamation marks in my transcription of the lines. That's because I feel like adding them would be unfaithful to the deadpan delivery of the lines. Again, the actual voice is ok, but it feels like Ms. Natochenny is putting too much effort in getting the voice down while ignoring the whole acting aspect of being a voice actor. I mean, could he possibly sound less concerned? I know I'm being harsh on Ms. Natochenny right now, especially since this is an early Season 9 episode, but it's just too baffling to imagine the takes used in the final version of this episode were the "best" of the batch. During the last leg of the Kabigon vs. Charem battle, the current opening theme in the Japanese version, Battle Frontier, plays in the background. In the dub, it's all replaced by standard dub instrumental music. The TO BE CONTINUED... screen is made four seconds longer in the dub.